Scientist Larry Mayer talked about carbon - how it moves between air, sea and sediment in earth systems. The topic has important implications for climate change and he described carbon as a "genie in a bottle" that humans are now releasing. Larry explained where carbon exists, in what forms, and where it stays. 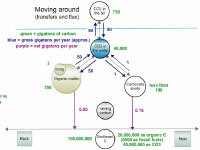 His series of concept maps, explained current best estimates about "standing stock" of carbon in different locations and forms, and illustrated rates of transfer between, and the residence times in, each location. 1 - Carbon in the Sediments 2 - How much carbon? Educator and graduate student Beth Campbell attributed the value of concept mapping as a teaching and thinking tool to the way it requires one to exercise higher order thinking skills in order to conceptualize and explain relationships between ideas and processes. She discussed the benefits and challenges of teaching students to use concept maps. She also shared an example of a complex map she developed over several months to help her organize her current graduate research about injury and regeneration in marine polychaetes. 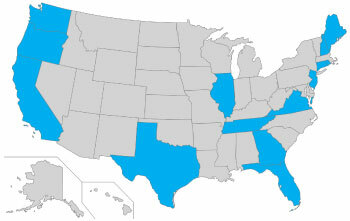 Thirty six participants joined the webinar from fifteen different states. Of the 10 participants who filled out the post webinar survey, 80% said that the scientist presentation was "useful" or "very useful", and 80% said they felt more comfortable with the topic than they had before. 50% also said they now feel the topic is more relevant to their own work.